Wintry weather doesn’t visit the coast of British Columbia very often but it certainly causes disruption when it arrives. Following back to back snow days, Vancouver has picked up almost 25 cm of snow with higher amounts in the Fraser Valley and Victoria has recorded more than 40 cm. An Arctic outflow pushing temperatures below freezing combined with low pressure off Vancouver Island is creating snowy rather than more typical rainy conditions. Traffic and transit services were snarled, schools were cancelled and scattered power outages kept crews busy in the region. Almost 7,000 customers are still without electricity in British Columbia after the most powerful windstorm in 20 years struck the province a week ago. BC Hydro says most of the remaining outages are in the southern Gulf Islands and those customers should be back on the grid by New Year’s Eve. At the storm’s peak about 700,000 customers were in the dark after wind gusts of between 90 and 123 km/h were recorded on Vancouver Island and the Lower Mainland. After a brief quiet period over Christmas, the next system is coming this weekend bringing more active weather including rain, snow, and gusty winds. While Greater Moncton was hard hit by this week’s ice storm so was much of eastern New Brunswick including the Acadian Peninsula. At least three communities have declared states of emergency – Tracadie-Sheila, Lameque and Shippagan – in what has been the most devastating ice storm in recent memory. Two deaths have been reported and many others hospitalized for carbon monoxide poisoning related to an alternate source of indoor heating amid the massive power outages. Power poles have snapped in half under the weight of ice-laden lines and downed trees and branches have shut down roads as the cleanup begins. As of Saturday 28 January at 9am, NB Power reports about 46,000 customers are still without power and almost half are in the Acadian Peninsula. Some residents of New Brunswick have been without power for more than 24 hours after the worst ice storm in recent memory. NB Power has about 250 crews on the ground and more from neighbouring Nova Scotia trying to restore electricity in what officials are calling a “huge weather event”. By the end of today, the power utility believes 80 percent of customers in Greater Moncton and Sussex will be back on the grid while 60 percent in Shediac, Sackville and Miramichi should be restored. Warming centres have opened in several communities where residents can seek shelter and charge their electronic devices. Fortunately temperatures are not very cold and should not fall below freezing until early Friday. Three storms over a four day period brought an early blast of winter to Southeast New Brunswick. The first was a Nor’easter which packed the smallest punch with just a dusting of snow in Greater Moncton (2 cm), the second delivered heavy, wet snow (26 cm) and the third started as snow (5.8 cm) but changed to rain (7.6 mm). The heavy, wet snow brought down trees and branches causing thousands of power outages across southern New Brunswick on Wednesday. Thousands more lost power when snow fell across the northern part of the province on Thursday. NB Power says the aftermath of Arthur is the worst event for outages in the history of the provincial utility. At the peak, about 140,000 customers were left in the dark in New Brunswick and the majority of those were in the Fredericton region. 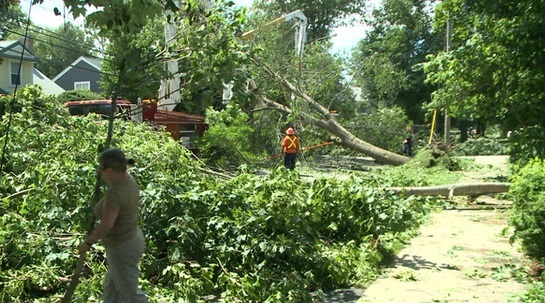 Officials in the provincial capital estimate more than 2,000 trees either came down or were damaged during the storm and that has created havoc for power crews. A spokesperson for NB Power anticipates that 80 percent of customers will have electricity back by Wednesday. In the meantime, a number of public buildings have been turned into recharging stations for medical devices, mobile phones and tablets/laptop computers. UPDATE – Eight days after Arthur, NB Power is still reporting about 4,000 outages, mostly in Greater Fredericton, due to a tangled mess of downed trees and power lines.